Super Savings Item! 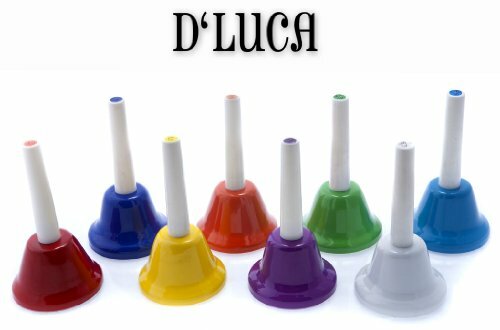 Save 38% on the D'Luca HB-8 Kids Musical Hand Bell Set of 8 Notes by D'Luca at Bass Brass. MPN: HB-8. Hurry! Limited time offer. Offer valid only while supplies last. Kids Musical Hand Bell Set of 8 Notes, HB 8. Hand Bell Set of 8 Notes. Introduce tonality and the one octave scale with these colorful hand bells. Kids Musical Hand Bell Set of 8 Notes, HB 8. Hand Bell Set of 8 Notes. Introduce tonality and the one octave scale with these colorful hand bells. Promote cooperation by having each child play one bell, creating their own melody. Ideal for kids 2 and older. Set includes 8 Bells. Notes on each bell. WARNING: ADULT SUPERVISION REQUIRED. Please remove all packaging material before giving this item to a child. Manufacturer: Sky Blue Telemarketing Inc. Publisher: Sky Blue Telemarketing Inc. Studio: Sky Blue Telemarketing Inc. If you have any questions about this product by D'Luca, contact us by completing and submitting the form below. If you are looking for a specif part number, please include it with your message.